The following is a brief account of the beliefs and superstitions associated with snake worship in southern India in the last century. Some of the practices may still be continuing. The text has also been edited to remove objectionable references to certain communities. Very closely connected with the subject of vows and votive offerings is that of the worship of snakes, to which vows are made and offerings dedicated. In Travancore there was formerly a judicial ordeal by snake-bite. The accused thrust his hand into a mantle, in which a cobra was wrapped up. If it bit him, he was declared guilty, if not innocent. In connection with snake worship in Malabar, Mr Upendra Pai gives the following details.6 Among snakes none is more dreaded than the cobra (Naia tripudians), which accordingly has gathered round it more fanciful superstitions than any other snake. This has led to cobra worship, which is often performed with a special object in view. In some parts of the country, every town or village has its images of cobras rudely carved on stone. These cobra stones, as they are termed, are placed either on little platforms of stone specially erected for them, or at the base of some tree, preferably a holy fig.7 On the fifth day of the lunar month Shravana, known as the Nāgarapanchami—that is, the fifth day of the nāgas or serpents—these stones are first washed; then milk, curds, ghī (clarified butter), and cocoanut water, are poured over them. Afterwards they are decorated with flowers, and offerings are made to them. The cobra stone is also worshipped at other times by those who have no male children, in order to obtain such. But to establish new images of cobras in suitable places is regarded as a surer method of achieving this object. For this certain preliminary ceremonies have to be gone through, and, when once the image has been established, it is the duty of the establisher to see that it is properly worshipped at least once a year, on the Nāgarapanchami day. The merit obtained is proportionate to the number of images thus worshipped, so that pious people, to obtain a great deal of merit, and at the same time to save themselves the expense of erecting many stone images, have several images drawn, each on a tiny bit of a thin plate of gold or silver. These images are handed over to some priest, to be kept along with other images, to which daily worship is rendered. In this way, great merit is supposed to be obtained. It is also believed that such worship will destroy all danger proceeding from snakes. The cobra being thus an object of worship, it is a deadly sin to kill or maim it. For the cobra is in the popular imagination a Brāhman, and there is no greater sin than that of killing a Brāhman. Accordingly, if any one kills a cobra, he is sure to contract leprosy, which is the peculiar punishment of those who have either killed a cobra, or have led to the destruction of its eggs by digging in or ploughing up soil which it haunts, or setting on fire jungle or grass in the midst of which it is known to live and breed. 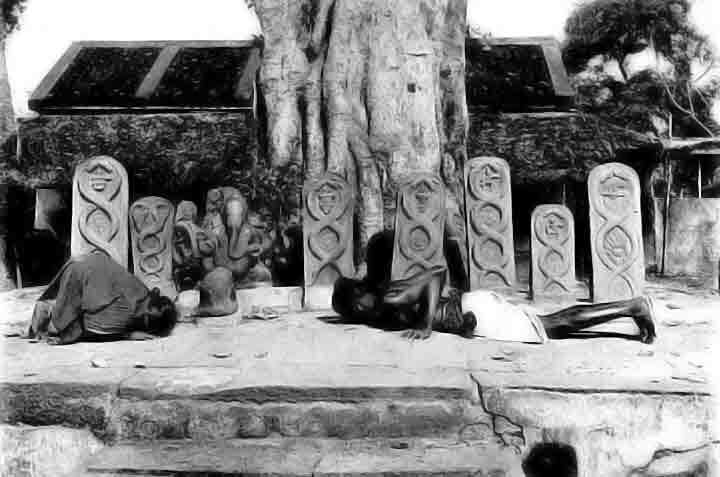 Praying for Offspring before Lingam, Snake-Stones, and Figure of Ganēsa. Other marvellous stories of the way in which the snakes carry out their trust are narrated. In many houses of the Tiyans of Malabar, offerings are made annually to a bygone personage named Kunnath Nāyar, and to his friend and disciple, Kunhi Rāyan, a Māppilla (Muhammadan). According to the legend, the Nāyar worshipped the kite until he obtained command and control over all the snakes in the land. There are Māppilla devotees of Kunnath Nāyar and Kunhi Rāyan, who exhibit snakes in a box, and collect alms for a snake mosque near Manarghāt at the foot of the Nīlgiri hills. A class of snake-charmers in Malabar, called Kuravan, go about the country exhibiting snakes. It is considered to be a great act of piety to purchase these animals, and set them at liberty. The vagrant Kakkalans of Travancore, who are said to be identical with the Kakka Kuravans, are unrivalled at a dance called pāmpātam (snake dance). Sometimes, it is said, it may be considered necessary to rub away the figure as many as one hundred and one times, in which case the ceremony is prolonged over several weeks. Each time that the snake design is destroyed, one or two men, with torches in their hands, perform a dance, keeping step to the Pulluvan’s music. The family may eventually erect a small platform or shrine in a corner of their grounds, and worship at it annually. The snake deity will not, it is believed, manifest himself if any of the persons or articles required for the ceremony are impure, e.g., if the pot-drum has been polluted by the touch of a menstruating female. 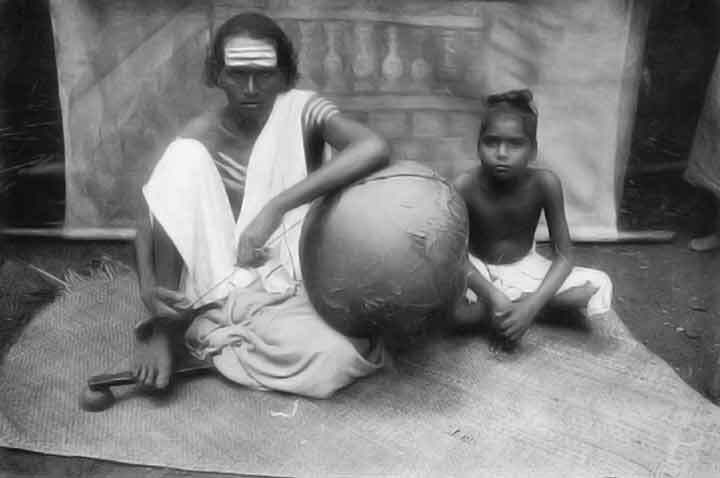 The Pulluvan, from whom a drum was purchased for the Madras Museum, was very reluctant to part with it, lest it should be touched by an impure woman. In addition to the pot-drum, the Pulluvans play on a lute with snakes painted on the reptile skin, which is used in lieu of parchment. The skin, in a specimen which I acquired, is apparently that of the big lizard Varanus bengalensis. The lute is played with a bow, to which a metal bell is attached. In the “Madras Census Report,” 1871,17 Surgeon-Major Cornish states that there is a place near Vaisarpadi, close to Madras, in which the worship of the living snakes draws crowds of votaries, who make holiday excursions to the temple, generally on Sundays, in the hope of seeing the snakes, which are preserved in the temple grounds; and, he adds, probably as long as the desire of offspring is a leading characteristic of the Indian people, so long will the worship of the serpent, or of snake-stones, be a popular cult. He describes further how, at Rajahmundry in the Telugu country, he came across an old ant-hill by the side of a public road, on which was placed a stone representing a cobra, and the ground all round was stuck over with pieces of wood carved very rudely in the shape of a snake. These were the offerings left by devotees at the abode taken up by an old snake, who would occasionally come out of his hole, and feast on the eggs and ghī (clarified butter) left for him by his adorers. Around this place he saw many women who had come to pray at the shrine. If they chanced to see the cobra, the omen was interpreted favourably, and their prayers for progeny would be granted. In the Tamil country, children whose birth is attributed to a vow taken by childless mothers to offer a snake cut on a stone slab, sometimes have a name bearing reference to snakes given to them, i.e., Sēshāchalam,20 Sēshamma, Nāgappa, or Nāgamma. Nāga, Nāgasa, or Nāgēswara, occurs as the name of a totemistic exogamous sept or gōtra of various classes in Ganjam and Vizagapatam. In the Odiya caste of farmers in Ganjam, members of the Nāgabonso sept claim to be descendants of Nāgamuni, the serpent rishi. 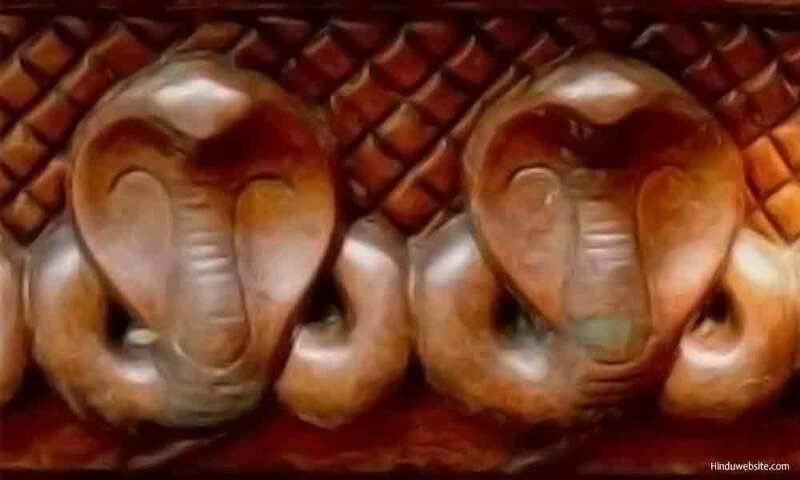 Nāgavadam (cobra’s hood) is the name of a subdivision of the Tamil Pallis, who wear an ornament called nāgavadam, representing a cobra, in the dilated lobes of the ears. The colossal Jain figure of Gomatēsvara, Gummatta, or Gomata Rāya, at Srāvana Belgola in Mysore,23 is represented as surrounded by white-ant hills, from which snakes are emerging, and with a climbing plant twining itself round the legs and arms. On the occasion of the snake festival in the Telugu country, the Bōya women worship the Nāgala Swāmi (snake god) by fasting, and pouring milk into the holes of white-ant hills. By this a double object is fulfilled. The ant-hill is a favourite dwelling of the cobra, and was, moreover, the burial-place of Valmīki, from whom the Bōyas claim to be descended. Valmīki was the author of the Rāmāyana, and is believed to have done penance for so long in one spot that a white-ant hill grew up round him. On the Nāgarapanchami day, Lingāyats worship the image of a snake made of earth from a snake’s hole with offerings of milk, rice, cocoanuts, flowers, etc. During the month Aswija, Lingāyat girls collect earth from ant-hills, and place it in a heap at the village temple. Every evening they go there with wave-offerings, and worship the heap. At the Dipāvali festival,24 the Gamallas (Telugu toddy-drawers) bathe in the early morning, and go in wet clothes to an ant-hill, before which they prostrate themselves, and pour a little water into one of the holes. Round the hill they wind five turns of cotton thread, and return home. Subsequently they come once more to the ant-hill with a lamp made of flour paste. Carrying the light, they go three or five times round the hill, and throw split pulse (Phaseolus Mungo) into one of the holes. On the following morning they again go to the hill, pour milk into it, and snap the threads wound round it. The famous temple of Subramanya in South Canara is said to have been in charge of the Subramanya Stānikas (temple servants), till it was wrested from them by the Shivalli Brāhmans. In former times, the privilege of sticking a golden ladle into a heap of food piled up in the temple on the Shasti day is said to have belonged to the Stānikas. They also brought earth from an ant-hill on the previous day. Food from the heap, and some of the earth, are received as sacred articles by devotees who visit the sacred shrine. At the Smasanākollai festival in honour of the goddess Ankalamma at Malayanūr, some thousands of people congregate at the temple. In front of the stone idol is a large ant-hill, on which two copper idols are placed, and a brass vessel is placed at the base of the hill, to receive the various offerings. At a wedding among the nomad Lambādis, the bride and bridegroom pour milk into an ant-hill, and offer cocoanuts, milk, etc., to the snake which lives therein. During the marriage ceremonies of the Dandāsis (village watchmen in Ganjam), a fowl is sacrificed at an ant-hill. At a Bēdar (Canarese cultivator) wedding, the earth from an ant-hill is spread near five water-pots, and on it are scattered some paddy (unhusked rice) and dhāl (Cajanus indicus) seeds. The spot is visited later on, and the seeds should have sprouted. 1 Madras Standard, 2nd June, 1903. 2 A tarawad means a family, consisting of all the descendants in the female line of one common female ancestor. 3 The senior male in a tarawad or tarwad. 4 See Calcutta Review, July, 1901, cxiii. 21–5. 5 Laterite is a reddish geological formation, found all over Southern India. 6 Madras Christian Coll. Mag., 1895, xiii., No. 1, 24–5. 7 The pīpal or aswatha (Ficus religiosa). Many villages have such a tree with a platform erected round it, on which are carved figures of the elephant god Ganēsa, and cobras. Village panchāyats (councils) are often held on this platform. 8 Indian Patriot, 13th January, 1908. 9 Elayads, Ilayatus, or Nambiyatiris, are priests at most of the snake groves on the west coast. 10 Calcutta Review, July, 1901, cxiii. 21. 11 “Malabar and its Folk,” Madras, 2nd ed., 150. 12 Madras Standard, 2nd June, 1903. 13 “Gazetteer of Malabar,” 1908, i. 112. 14 See “Men and Women of India,” February, 1906. 15 “The Cochin Tribes and Castes,” 1909, i. 153–4. 16 “Malabar and its Folk,” Madras, 2nd ed., 147–8. 18 “Gazetteer of the South Arcot District,” 1906, i. 102. 19 “Gazetteer of the Tanjore District,” 1906, i. 70. 20 Sēsha or Adisēsha is the serpent, on which Vishnu is often represented as reclining. 21 “Ind. Ant.,” 1876, v. 188. 22 See the Skanda Purāna. 23 Other colossal statues of Gummatta are at Karkal and Vēnūr or Yēnūr in South Canara. 24 The feast of lights (dipa, lights, avali, a row).